Posted byadmin	 13. 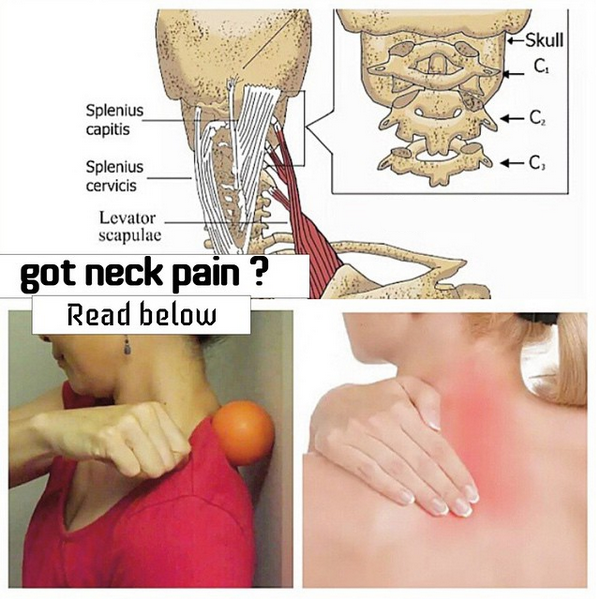 February 2016 Leave a comment on Got Neck Pain? Everyone gets tight neck and shoulders, whether you are an athlete, office worker or new mum – this easy myofascial release exercise will give you huge relief! Not only will this exercise ease neck and shoulder tension but also improve shoulder range, ease headaches, make you more upright and just make you feel great! Lie on your back with your knees bent up and place the ball under your upper traps as shown. You will be able to feel the knots and tight muscles through this area (they will feel harder, often tender and like a marble or golf ball). Self trigger point of upper traps and stress pointsNext bring your arm up and back towards the ground and then oscillate it up and down (grind it!). Tip: If you do not feel it enough (not painful enough!) lift your bottom off the ground and put all your weight through the ball. This is a fantastic technique and once you have tried you will see what I mean! For the is best results and long-lasting relief, do this every evening or as a break at work. This myofascial release is great to combine with a couple of other things that will combine to create a long-term fix! It is important to look at the muscles (which we are doing here) AND the joints, so try out this easy spinal self-mobilization or this back stretch your mobility. Related article: What is your belly fat type?